Xiaomi Mi A1, OnePlus 5T, Pixel 3 XL, OnePlus 6T and more smartphones are claimed to have the highest levels of radiation according to a recent study. Check how much radiation does your smartphone emit, here. Smartphones have become a very essential part of our lives and while we use a smartphone in almost every hour of the day, they also make our lives easier in ways nobody could have thought some years back. However, according to a new study, it has been found that some of the most popular smartphones including Xiaomi Mi A1, OnePlus 5T, OnePlus 6T and more emit the highest level of radiations as well. In a report by Statista, it was claimed that current smartphone model from Apple, BlackBerry, LG, Motorola, OnePlus, Google, Samsung, Xiaomi, ZTE and more were analysed to come up with a list of smartphones which emit the highest amount of radiation or have the highest radiation levels. The report included all the current smartphones as of December 10, 2018, while the results have left us surprised. The Xiaomi Mi A1 which was launched in India in the year 2017 and is also the first stock Android smartphone from the company, has been rated to have the highest radiation levels while OnePlus 5T, which was one of the best sellers in 2017-18 in India, came second on the list. Xiaomi Mi A1, OnePlus 5T, Xiaomi Mi Max 3, OnePlus 6T, HTC U12 Life, Xiaomi Mi Mix 3, Google Pixel 3 XL, OnePlus 5, iPhone 7 and Sony Xperia XZ1 compact are the top 10 phones respectively on the list shared by Statista. 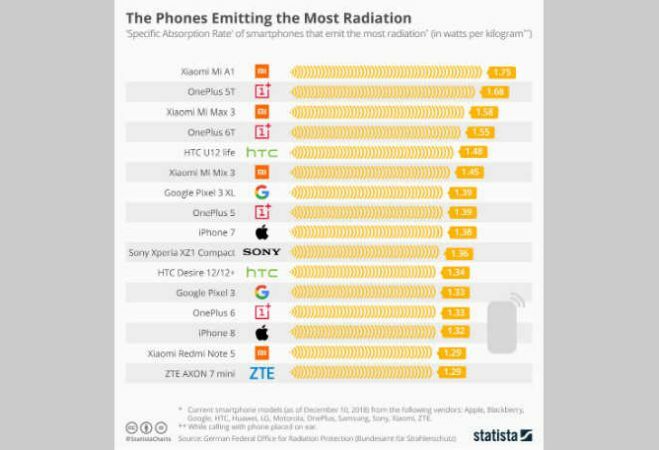 HTC Deiste 12/12+, Google Pixel 3, OnePlus 6, iPhone 8, Xiaomi Redmi Note 5 and ZTE AXON 7 Mini were also part of the list which included the top 16 smartphones emitting the highest level of radiations in the world. Surprisingly, no Samsung smartphone was in the top 16 despite the fact that premium smartphone makers such as Apple and Google too had their smartphones in this list of phones emitting the highest level of radiations. On the other hand, it is worth noting that every smartphone has its respective Specific Absorption Rate or SAR value which is based on its radiation levels and in order to check the radiations levels of your smartphone, you find the needed details on its retail box.